The M/V WIT Concrete II was built in 1943 by the National Ship Company in Oakland, California. She is a 350ft long bulk carrier that was used for towing in the pacific, primarily for gasoline. The vessel was initially sunk during hurricane Marilyn in 1995, and was again raised by the Army Corps of Engineers and sunk two miles south of Porpoise Rocks, South St Thomas. There is a rarely seen, but resident goliath grouper on this wreck. The wreck today lies intact and upright, with easy access and swimthroughs in most compartments. Many of the internal fixtures and fittings such as cage-lights, switches and valves remain for viewing, frozen in time. Externally, on the main deck remains the auxiliary steering wheel, as pictured above. 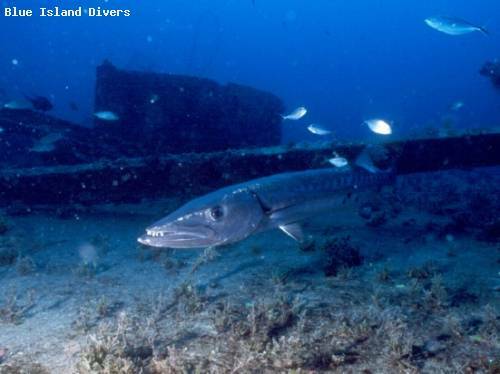 The wreck has attracted a great deal of marine life. It is common to encounter large schools of Horse-Eye jacks, Bar Jacks and others. At the bow of the ship there is a large winch type device that has become the home to a cornucopia of reef fish. Lobster have made their home in the crannies and crevices. Southern Rays lie on the top deck while taking a rest. Nurse Sharks, Barracuda and Sea Turtles frequent this gorgeous site. As you ascend from the sand up to the bow you'll see the wreck has been encrusted in beautiful colored sponges and hard corals. Usually you find several pairs of large French Angelfish swimming among the Gorgonians. When you do your safety stop from the M/V WIT Concrete II, keep your eyes gazing along the sandy bottom for Nurse Sharks and Rays. A truly magnificent shipwreck!